Nothing is easy in Venice. The city presents a set of very unique challenges that take a whole lot more effort and thought process than most of us would ever dream of. I have a profound respect for all the people of Venice, and most especially, those who protect, serve and maintain her. I am also grateful to all of these people for the preservation of this most unique and magnificent city. A city unlike any other in the world. “There is nothing ordinary. Only extraordinary.” Surely this is Venezia! The Vigili del Fucco Fire station in Venice, as in many cities, does more than respond to fires. Venice also has the only team in the world working exclusively on water. The regular speed for the canals is 3 mph. Emergency boats will travel at speeds of 30 mph. In bad weather like Winter, a boat sinks almost daily. If boats are tied too tightly, one end will dip and waves from passing boats, and the changing water levels, will quickly fill the boat with water. The obstruction caused by a sunken, or partially sunken boat, is a dangerous situation on the busy canals. The Fire Department is called upon to “rescue” these boats. If possible they will pull them to the surface but many times, if there is too much water in them, they cannot. In cases like this, they use a balloon to bring it up to the surface. An even more serious call is of course, one of fire. Venice is mainly built on wood with wooden floors wooden lofts and wooden ceilings. Should a fire take hold? It can quickly spread to an entire block. Venice is a virtual Tinder Box if you think about it. Once a fire is extinguished, the building has to be deemed safe. An ember can continue to burn in a rafter, a ceiling or wall that cannot be seen by the human eye. The fire fighters use thermal devices to go over every inch of the building before it can be declared safe. A time consuming process to be sure. Any area less than 100 degrees, is considered safe. It was not until after the devastating fire of the landmark 18th Century Opera House, Fenise in 1996, that fire hydrants were installed. Unfortunately, not all parts of Venice have them. Add to this that the canals often are not deep enough for the fire boats to be used. There are times that canals may be emptied and sectioned off because of restorations being done to buildings in the area. At times, the canals are so congested with boats, that they can’t park close to where the call is. It isn’t like elsewhere in the world where firetrucks can pull up to a burning building. Instead, firefighters have to carry their heavy hoses, pumps and ladders with them through the streets and over bridges. In addition, they are quite skilled in the art of walking on rooftops to get from one building to the next. Another hazard for the fire fighter when speeding to a call, are the low bridges. Serious injury results if they forget to duck when passing beneath a low bridges at high speed! Just like the Fire Department, finding a place to park the Ambulanza can be difficult. Sometimes the people calling for help don’t know where they actually live at least not being able to clearly tell someone else. Elderly residents that are hard of hearing often can’t hear the knocks on the door. There are times that the rescue teams can’t find the address they are sent to. The numbers are not in the GPS System Services. Venice is a maze of streets and squares each with their own numbering system. This only adds to the confusion in trying to locate a person’s home and respond to a call. For the Fire Fighter and Medic the challenges are many when responding to a call. Items coming into Venice are loaded onto boats from the island of Tronchetto. Navigating the sometimes congested canals can be a tight squeeze as seen below. Heavy items, such as large sculptures during the Venice Biennale, International Art Exhibition, present a specific set of problems. In Venice there is a limit of 5 tons per square meter and anything heavier cannot be transported manually. If there is a hole under the Masengi , Venetian Paving, the item could fall through. Heavy items must be transported using special boats. Special boats as well as knowledge of boats in general, are a must for a Venetian. Bringing in sculptures weighing as much as 4 tons each to the 16th Century buildings requires its own special skill set. Working in confined spaces makes it hard to maneuver. Before anything can be done, it needs to be assured that the floors are full, meaning there is no cellar. Floors that have a cellar beneath them can collapse under the weight. Pressure on the floors must also be precisely calculated. Moving and placing an item is a painstaking process that is done centimeter by centimeter with the utmost precision. These men were unloading scaffolding materials that they then had to carry to Calle Lunga San Barnaba. Quite a bit of work has to be done even before the work can begin. Again, nothing in Venice is as easy as it would appear to be. Trash collection, something that is done behind the scenes that we come to rely on, but don’t give much thought to how it all happens. In a city of islands and canals, with ever changing tide levels, and collection being done by hand, what we think of as a simple task? Is anything but simple. Trash collectors must push/pull carts through the Calli of Venice through the winding, sometimes very narrow streets, up and over bridges, there are over 400 bridges in total! Each cart holds 900 liters of trash. They collect up to 20 cartloads per shift. Keep in mind that these garbage collectors are doing their job, in all manner of weather, without the aide of any protection from the elements. They don’t have the advantage of riding in trucks, or trucks outfitted with electronic arms that reach out, grab the trash container and empty it, the operator never having to leave the inside of the cab. We all know the old saying of the Postman, ‘Neither rain, nor sleet, nor snow …..’ – the same is true of the trash collector in Venice! During Aqua Alta, high water that floods the cites Calli, having to wear tall rubber boots, only adds to the effort needed to walk around. Not to mention the effort needed to walk through standing water. Once the cart is full, it has to be brought back to where the collection boat is moored. The problem is, because of changes in the tide, the boats may not be where they were originally, and the trash collector now has to locate the new mooring and take his cart there. Once the new mooring is found, the trash is put on the collection boat and crushed, up to 1/2 ton of daily garbage on average is collected and crushed. There are no landfills in Venice. The crushed garbage is then taken to Fusina, to a processing plant, where it is turned into energy pellets that replaces coal for energy. Venetians can perhaps take solace in the idea that their electricity is generated by their own garbage. Each year, tourists create garbage adding up to an extra 100,000 residents, creating even more power for the city of Venice. 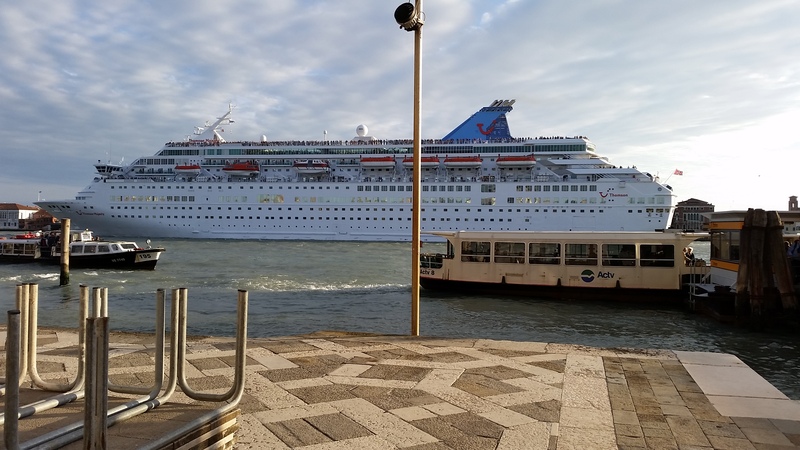 Over the last decade the number of cruise ships coming into Venice has doubled. Up to 1000 cruise ships and ferries pass through the City Center each year, making Venice, the 4th largest port in Europe. Boat Pilots have to board each vessel to guide them safely into the city. Normally a boat pilot will guide 3-4 ships per day. The pilots instructions have to be precise, as at its narrowest point, the Giudecca Canal is 200 meters wide. There are but a few meters separating these giants from the city. Tugboats are also used to guide them in. There are 9 tugboats operating each day guiding an average of 3-4 ships per tugboat. It is up to the tugboat captain to determine things such as the length of the guide line being used. There are of course many other aspects and circumstances to the inner workings and how things get done. This is just a small look at what goes on to keep the city of Venice running smoothly and for us the visitor, to enjoy all that it has to offer. “Working in Venice is like a postcard. But every place is a special moment.” as said by a tugboat pilot. I know that the next time I visit this truly amazing city, I will have a better understanding and appreciation for those that work here. I would love to hear your comments and especially, comments from a Venetian would be a wonderful perspective. Judging by the happy Venetian’s I observed, these challenges appear simply to be a part of daily life taken in stride. That’s not to say there are not times I’m sure, that they are frustrating, but in the end, as you point out, perhaps all worth it? It is such a magnificent city that to an outsider such as myself, it would be almost a privilege to live here. It is a shame that so many are forced to leave because of the high cost of living and inability to make a decent living. What will Venice be without her Venetians? Thank you so much for your response Luca. I look forward to reading more of your blog.